See That There: honeycomb shelves for free! The other day I was Foot Locker while Jon shopped for shoes and I noticed some modern, white glossy shelves. They were a temporary, promotional display for a pair of New Balance shoes. I worked at Foot Locker years ago (that's where I met Jon) and I knew that they normally throw those displays away after they were done with them. These shelves weren't cheap shelves. They are a very thick, glossy, plastic in the shape of a honeycomb! So, I decided to ask for the shelves when they were done with them. I really didn't expect to get them, I figured an employee would have claimed them first, but to my surprise they had three extra honeycomb shelves in the back room! And they gave them to me! 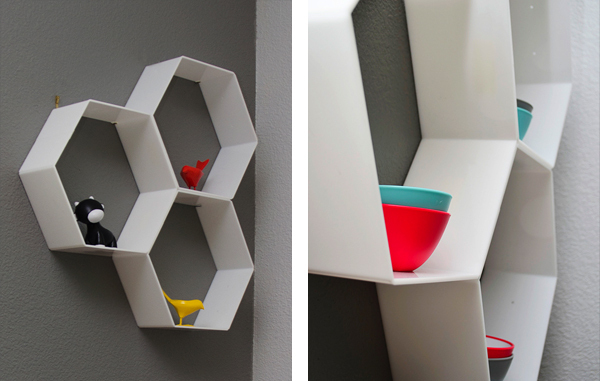 They also had some teeny, tiny honeycomb shelves that I might check back for. So we took the shelves home, wiped them down, removed the paper inserts and they were ready to go. There is very little about the shelves that makes them look like commercial displays. There are two tiny holes in some of the honeycombs and they have a piece of thick clear plastic that holds the honeycomb together, but neither of these things is very noticeable. You can see the tiny holes in the picture on the right. In the upper right hand corner. You can kind of see the clear plastic block in the first large picture. The honey comb with the black Kid Robot in it, has a little clear block on the top left. We used heavy duty, double sided foam tape to stick the shelves together, and then supported them on the wall with picture hooks and nails. I think they look store bought and expensive, but they were completely free. 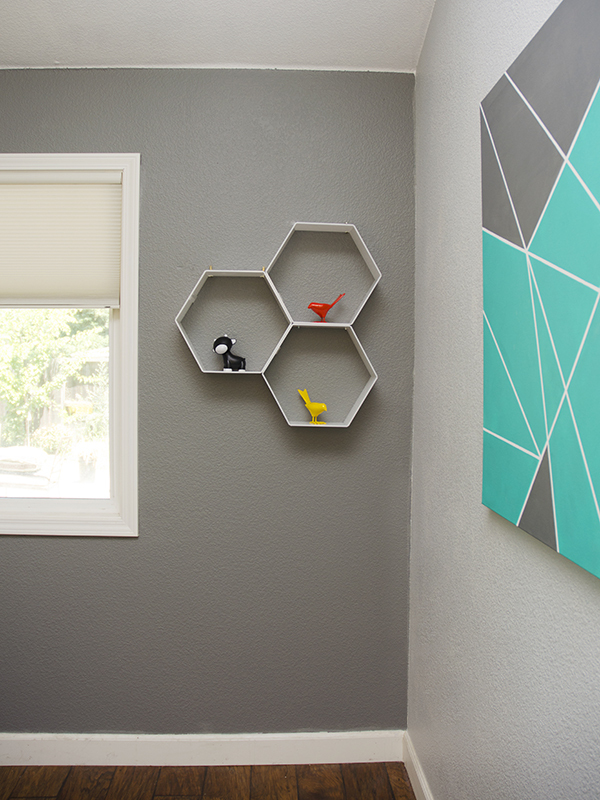 If you think you might want honeycomb shelves, don't be afraid to ask for Foot Lockers displays. They'll go to waste after they're done with them anyway. I got lucky with the extra shelves in the back, but if they don't have extras available, ask them if you can leave your phone number or email so they can contact you when they're done with the display. They might not call, but again, it's worth a try. If I were a manager at a Foot Locker, I would call. Oh! That is resourceful! I would be too afraid to ask a store for their display shelves. But the worst they can do is say no, right? Also I am completely mesmerized by your painting. I have all the materials and have been meaning to make one since I saw it on pinterest last year but have still yet to do it. I love the blue you used, and the size! Suits the space well. Thanks Stephanie! Yeah normally I hate asking for display cases. But I loved these so much that I just went for it. I say normally because I've done it before! Lol. I think I asked for a poster or something. 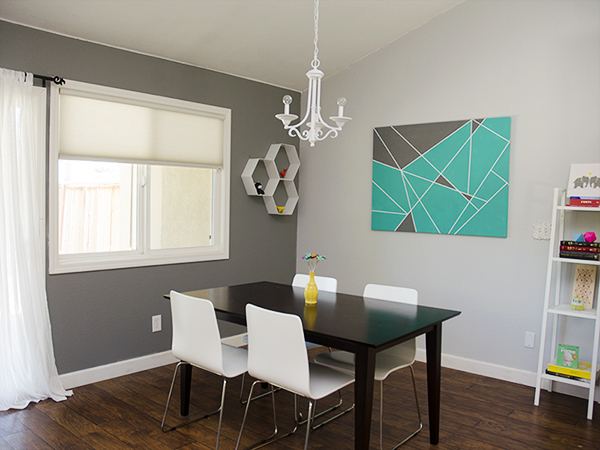 So glad you like the wall color, that's a somewhat recent change, when we bought the place it was all a light tan color. what a great idea! i don't go to the mall too often but i could see where the larger box stores like foot locker do just discard displays sent by the brands. fabulous idea . . . now i can add one more thing to my list to be on the look out for! your space looks fabulous btw! Lucky you! Very nice painting! 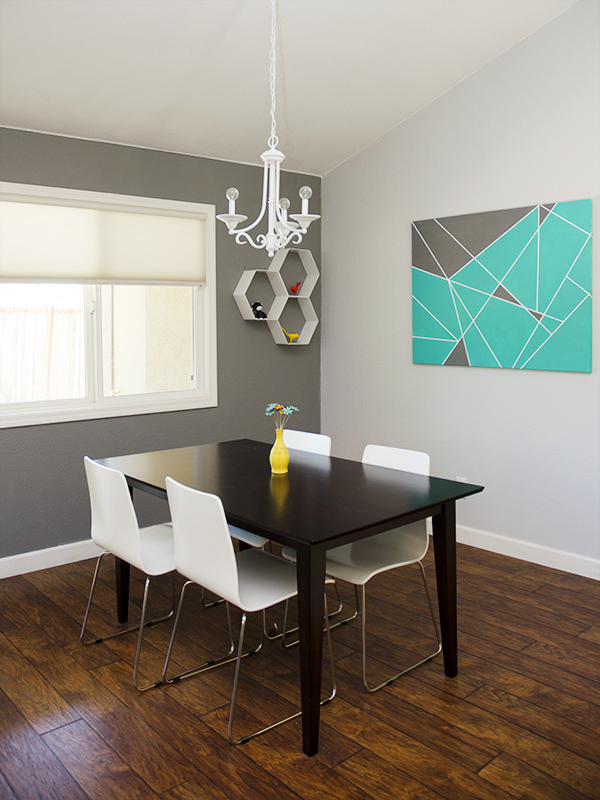 Love the simplicity of your dining room and mostly the grey wall!